Population size - the population size is the size of the genetic breeding pool, i.e., the number of individuals that fill the population. If this parameter is set too low, there will not be enough different kinds of individuals to solve the problem well. If there are too many in the population, a good solution will take far too long to find because the fitness function must be calculated for every individual in every generation. Excel is relatively slow at executing the fitness function in the formulas (as compared to executing fitness functions from a C or Visual Basic program). Usually, between 20 and 200 individuals will give good results, and Population size = 50 is a good number with which to start. The maximum size you may select is 2000. Random seed - GeneHunter gives you the ability to reproduce results of previously run evolutionary cycles. 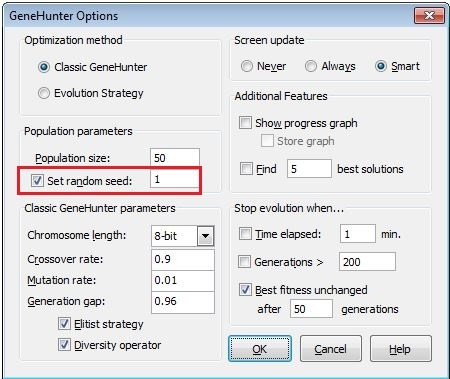 Since a random number generator controls the generation of initial populations, GeneHunter gives you the ability to specify the initial random number seed in the Options dialog box. Using the same seed ensures reproducibility when running several trials. This option can be turned off to allow randomization of the initial seed. The default setting is on, meaning the same random number seed will always be used if you do not change it. The “Set Random Seed” box lets you reproduce the same population or create a new one. Select GeneHunter from the Tools Menu in Excel 2003 or the Add-Ins menu in Excel 2007 and 2013. The GeneHunter main dialog box is displayed. Click on the Options button. Click on the check box labeled Set random seed and type a number in the edit box. The random number may range from 0 to 32757. GeneHunter will begin with the same population each time it is run. Using this option will enable you to reproduce results. Select GeneHunter from the Tools Menu in Excel 2003 or the Add-Ins menu in Excel 2007 and 2013. The GeneHunter main dialog box is displayed. Click on the Options button. Remove the check box from the box labeled Set random seed. GeneHunter will generate a new random population each time it is run. Use this option if you want to experiment with a variety of solutions.